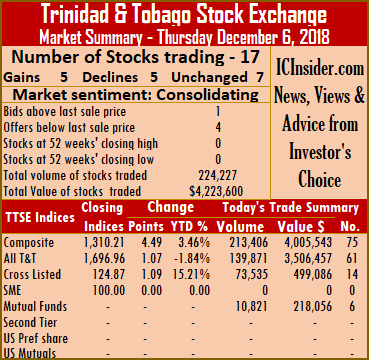 In market activity on the Trinidad & Tobago Stock Exchange on Thursday ended with trading in 17 securities against 16 on Wednesday, with 5 advancing, 5 declining and 7 remaining unchanged on a day when both the volume a value of trading fell below Wednesday’s levels. At close of the market the Composite Index gained 4.49 points on Thursday to 1,310.21. 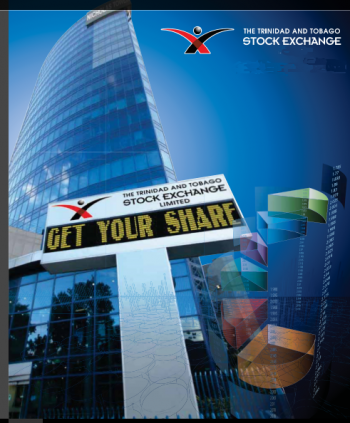 The All T&T Index inched 1.07 points higher to 1,696.96, while the Cross Listed Index rose 1.09 points to close at 124.87. Trading ended with 224,227 shares at a value of $4,223,600 compared to 920,887 shares at a value of $4,495,578 on Wednesday. IC bid-offer Indicator| The Investor’s Choice bid-offer ended with 1 stock with the bid lower than the last selling price and 4 with lower offers. Stocks closing with gains| First Caribbean International Bank rose 25 cents and completed trading 47,493 units at $8.30, First Citizens added 4 cents and settled at $32.80, after exchanging 1,000 shares, JMMB Group increased 3 cents and concluded market activity at $1.80, after exchanging 12,000 shares, Republic Financial Holdings rose 26 cents and ended at $107.26, after exchanging 1,000 shares and Trinidad Cement closed with a gain of 3 cents at $2.65, after trading 6,236 shares. Stocks closing with losses| Clico Investments shares fell 5 cents and ended at $20.15, with 10,821 stock units changing hands, National Flour closed with a loss of 2 cents and completed trading 32,351 units, at $1.63, NCB Financial Group shed 1 cent and settled at $8.92, after exchanging 7,000 shares, Trinidad & Tobago NGL lost 10 cents and closed at $29.15, after exchanging 65,990 shares and West Indian Tobacco ended trading of 5,167 units 43 cents lower to $95.07. Stocks closing firm| Angostura Holdings ended at $15.80, with 2,000 stock units changing hands, Gaurdian Media concluded trading at $15, after exchanging 50 shares, Grace Kennedy ended at $3, with 7,042 stock units changing hands, Guardian Holdings completed trading of 201 units at $18, Massy Holdings ended at $45, after exchanging 5,350 shares, One Caribbean Media concluded market activity at $10.50, after exchanging 13,514 shares and Scotiabank completed trading at $64.74, with 7,012 units.